Today on 3D I am featuring a multi talented artist Ritu Dua who blogs over at 'Beneath My Heart Art'. Ritu is a wonderful artist and a very humble human being who has a dream of helping society and underprivileged children. Read on her interview and let her know what do you think about her dreams and passion. Welcome Ritu, It feels so good that you are sharing something about you and your passion here on Design Decor & Disha. Please let us know little more about you. Disha, thanks for giving me this chance to be here . I am humbled. I have been a banker and a teacher but art and colors have been my all-time passion. I have loved to draw and paint since I was a kid. Right now, I have allowed myself to be drifted away with the flow of paints and my imagination and thoughts. It’s not only art that fascinates me but anything that is related to being creative makes my little heart smile. When and how you realized your passion about Painting. As I said earlier, it has always been there! I engaged myself in other jobs but the urge to create has always been a part of my routine. I have been blessed with a wonderful husband and am a proud mum of two amazing sons…touch wood…and they have been a constant source of inspiration to me. 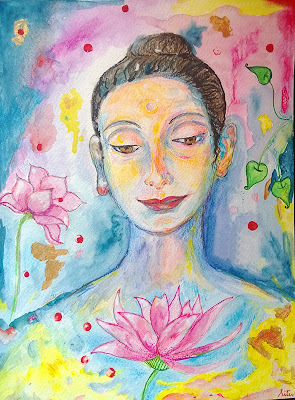 I have realized that it is when I immerse myself in my art that I discover the real ME within me and this certainly lifts my spirits up. How you stepped into a blogging world. In what ways has blogging affected your passion. If art is my first love, writing is second. Actually they run parallel to each other. Writing had always been in my heart like a candle ready to be kindled. So, it was last year in April that my elder son asked me to step into this wonderful world of blogging and I am extremely happy that I did. My blog…Beneath my heart…Art…has not only enabled me to satisfy my lust for art but has also allowed me to pour my heart out in the form of my writings. I am at awe after entering this amazing world of blogging…such creativity…so much talent…I fall short of words. And I would love to mention that in this journey of less than a year, I have met so many wonderful people here. Though we are all physically distant but I think this bond that art and creativity has created, is strong enough to hold us together for years to come and you Disha are one such beautiful friend I have. Thanks Ritu I am touched. Even I feel the same . Ok now I'll come to my next question how many mediums and techniques of painting you have worked on. I have tried my hands on various mediums, I find water colors quite magical, the acrylics charm me with their brightness and the oil paints with their richness. But I feel mixed media is my forte and my fingers are my favorite tool. I have also worked with nib and pen, especially while doing zentangles. 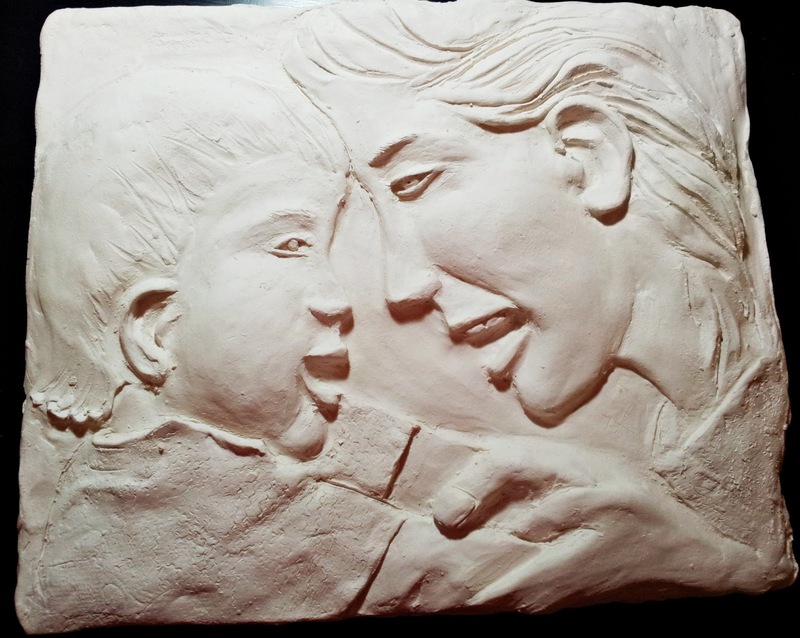 A few months back I attended some sculpture classes and had the chance to work with clay. Oh, I must tell you that it is such an amazing feeling when your fingers play with that creamy cold clay. I found it quite an unforgettable experience. When I was in Tanzania, I worked with an interior designer and created some large murals for a penthouse. I would cherish those creative moments forever. I also love creating art from trash. While in Delhi I associated myself with an NGO and held a workshop for under privileged children teaching them to create artistic things from waste. So basically it is anything artistic, colorful and creative that makes my world go round. Which one is your favorite medium and why. I love doing artwork in mixed media. It not only gives me freedom to play with so many mediums in one go but also satisfies my urge to create differently. It helps me to translate all my ideas into reality. In the process I achieve a result which is enhanced by the properties of various mediums and is much beyond what I could have achieved using only one medium. In short I find mixed media quite adventurous as it allows me to paint my own rainbows. What inspires you to paint. Is it nature, human, everyday life or something else. 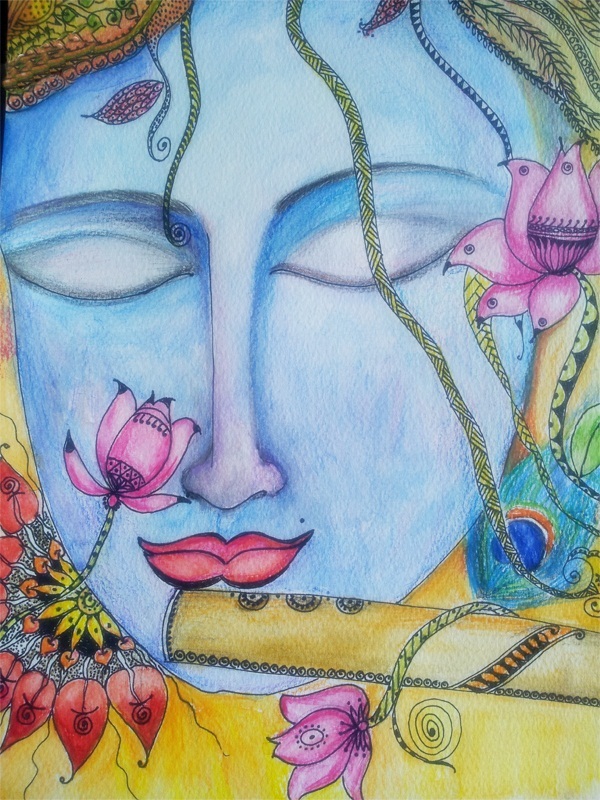 I get quite intrigued by faces...faces that evoke beauty, love and tranquility. Chirping birds (peacocks being my favorite), bright flowers, tranquil sea, white fluffy clouds …oh the list is non-exhaustive. 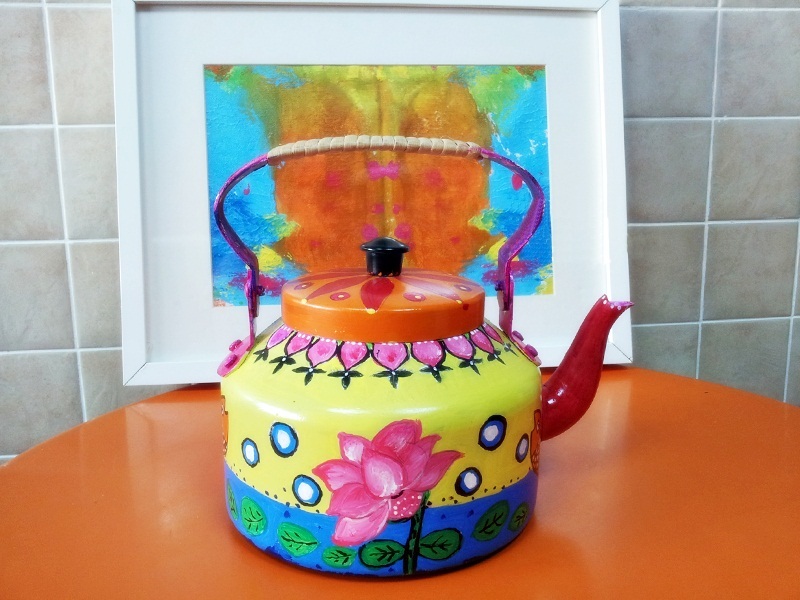 I also get fascinated by all things Indian …various forms of folk art in bright and cheerful colors. What other than Painting excites you. I love cooking too. We are pure vegetarians and I love trying out different dishes. Cooking wholesome, colorful and healthy meals for my family and friends gives my pleasure abound. The sight of bright colorful vegetables in the market enchants me. I don’t refrain myself from giving my cooking a touch of my art. After all cooking is a form of art too. Besides this,I like to decorate my house and try to create an ambiance that makes me and my family delighted after a tiresome day. 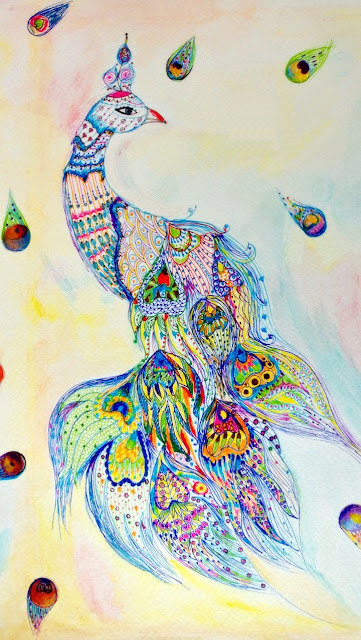 Please share the links where we can find your Art work and where my blog readers can get connected with you. Which blogs inspire you and you love to visit them regularly. This is a very difficult question because there are so many bloggers out there and each one of them has their own style of writing and doing things. They all touch my heart in some way or the other. I derive so much pleasure visiting them and having a glance at their beautiful creative world. Last but not the least, as everyone dreams of being something in life, what you have dreamed of. Oh Disha this is the loveliest question you have asked. Each day I want to wake up with a smile and go after life…live it, paint it in my own way, feel it and celebrate it and that’s it. I would like to open an Art café where people like me can come and live some unforgettable moments filled with cheerful colors. I also wish to pay back to society by helping children who are not so blessed by sharing a part of my resources with them, educating them and helping them live a happy life. Thanks Disha for having me here. Wow that was so inspiring and nice interview with a lovely lady Ritu. Thanks once again Ritu for taking out sometime for answering all my questions. Well like Ritu sometimes I also allow myself to be drifted away with the flow of paints and result is always soul satisfying. Here is artwork that I had done years ago and then one fine day decided to dip my fingers in color and gave facelift to it. Very uplifting work from Ritu, loved her colorful expressions, a pleasure to enjoy.. Disha, liked your art work too. Thanks Padmaja!! You are right she creates magic with her brush and her artwork is always a great pleasure to see!! what a really heartfelt post filled with beautiful art and words by Ritu. I feel so much like she does about blogging and the community of bloggers. 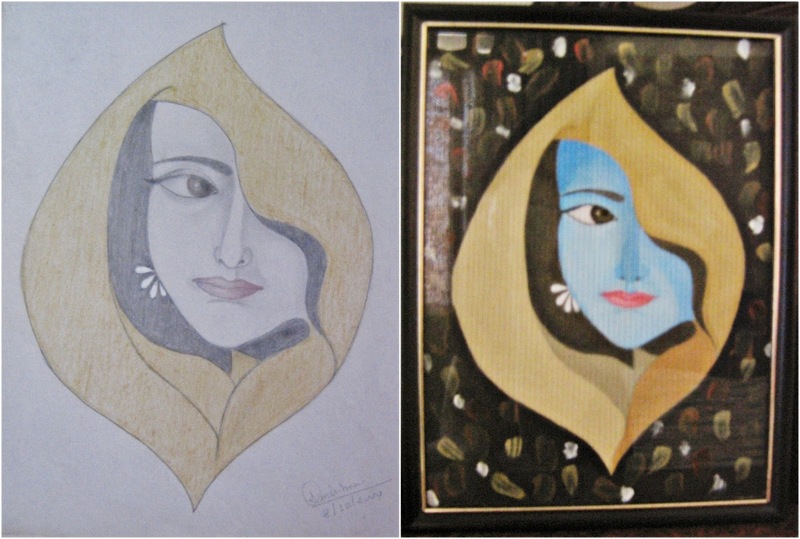 Disha, the facelift you gave your painting makes all the difference-it would make glorious notecards!!! Thank you both! Thanks Linda, so sweet of you. Even I have similar feeling about blogging and fellow bloggers. Thanks for your appreciation. Disha, I like how you have added color to your art work. It brightens it and makes the image stand out more. Thanks for all the wonderful info on Ritu. I do enjoy seeing her work on Paint Party Friday. She is a talented artist, as you are. I'm honored Faye thanks a lot for appreciating my work. Ritu indeed is a talent artist and love her unique style. Thanks for introducing us to Ritu, Disha :) The interview was truly inspiring. And I love the face-lift you did with your painting.